We just love the Peanuts gang. My husband and kids have Snoopy shirts they love to wear. Now they can play with their favorite characters. The beloved Peanuts characters come to life in an all-new bubble shooter game from the makers of Panda Pop! Help Snoopy and the rest of the Peanuts gang rescue Woodstock and his flock of birds who have been trapped in bubbles in the newest game, Snoopy Pop! Snoopy Pop is a fun and exciting game! Travel through the the colorful fun game with Snoopy, Charlie Brown, and other members of the Peanuts Gang. Going from level to level, you are trying to save Woodstock and his bird friends who are trapped in the bubbles. Be sure and read all about this fun new app in Donna's full post here! 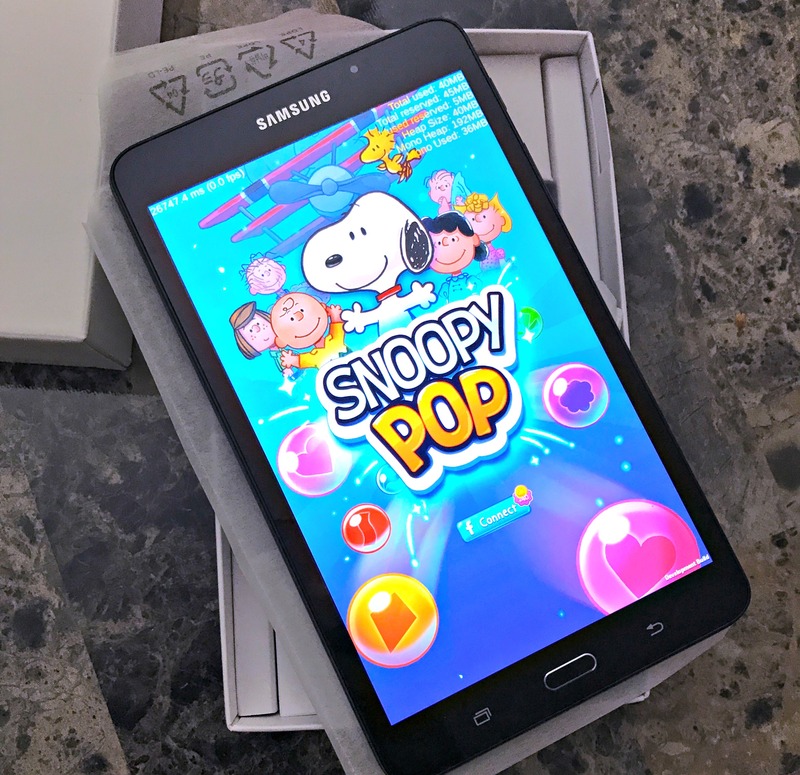 And because we're so excited we're giving one lucky fan a Samsung Galaxy Tablet that comes loaded with Snoopy Pop! 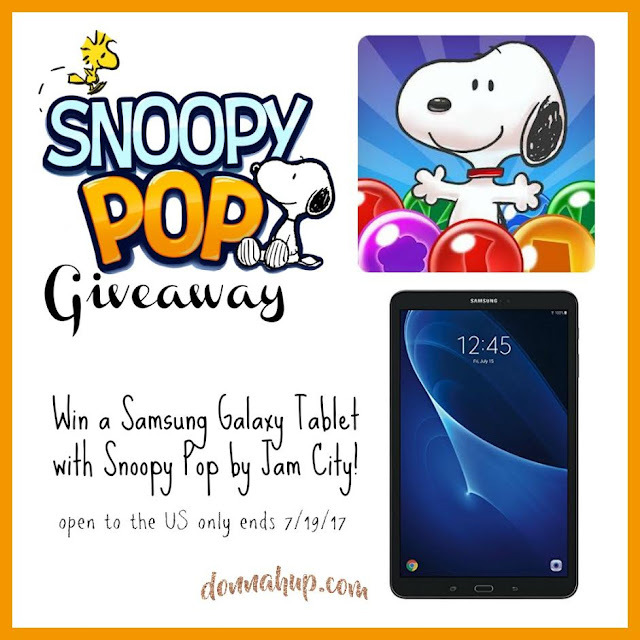 One lucky reader will win a Samsung Galaxy Tablet loaded with Snoopy Pop by Jam City! Giveaway is open to the US, 18 years and older and ends 7/19/17 at 11:59 pm CST! The Mommy Island is not responsible for prize fulfillment. Good luck! I love the Peanuts Gang! Snoopy & Woodstock are my favorite. They are hilarious BFFs! Growing up my family always called me Pigpen. For some reason messes have been following me for my whole life. I don't try to get things dirty and make a mess it just seems to happen. We love all the Peanuts gang but Snoopy is our favorite. My favorite character is Snoopy! Woodstock is a cutie too. I have 2 favorites. Snoopy and Woodstock. You just can't have one without the other. I have always had a soft spot for Charlie Brown but love Snoopy. Snoopy has always been my favorite! Love the whole Peanuts gang though! Snoopy has always been my favorite Peanuts character! Snoopy and Pigpen are my faves! -Jenna O.
Linus is my favorite character. Snoopy will always be my favorite! I like Pigpen because the dirt just jumps on him when he's trying to not get dirty. My Favorite Peanuts Character is Snoopy..
Ny favorite one is Snoopy. He is just classic and he makes sense. I also like Schroeder because he has a dry sense of humor for a kid.